Before the Catholic Church was established in Doylesburg, people from nearby would come into Doylesburg to a Catholic home to hear Mass from a traveling Catholic Priest. The first Catholic priest of the valley was Father Dennis Cahill who had arrived from Ireland. His first mass was celebrated at the Timmons homestead. People from Amberson Valley which is located on the other side of the Conococheague Mountain would walk barefoot across the mountain wearing a path which is still in existence today. A marker which reads the "Catholic Path" was placed along the side of the Path Valley Road where the path crosses. 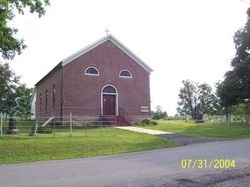 In 1802 a log church was built in the Doyle family grave yard that was on the property of Felix and Sarah Doyle. On November 7th 1816, Felix and Sarah deeded the land to the Roman Catholic Church which today is still known as St. Marys Roman Catholic Church. The present cemetery in the Church yard must have been established before 1800 as is the evidence by the dates on the tombstones. Additional land was donated to the Catholic Church by the Doyle family on April 20, 1852. John and Mary Doyle deeded 89 perches of land for the consideration of $ 1.00 to Rev. John Newman, the Roman Catholic Bishop of the Diocese of Philadelphia for the purpose of a place of worship and burial ground. The land was more than likely added for the cemetery. The following headstone inscriptions were copied by myself on two separate trips to Doylesburg on July 30th and September 4th of 2,000. The "/" mark represents what information is on the next line of the headstone. THOs. J.S. DOYLE / DIED / Sept. 14th 1828 / AGED / 40 Years 1 Month & / 14 Days. WILLIAM DOYLE / Died 1826 / Aged 14 yrs. ANN / Wife of / BARNABAS DOYLE / Died Nov. 12, 1868 / Aged 82 years. BARNABAS DOYLE / Died FEB. 1820 / Aged / 47 years. In / Memory of / BARNABAS DOYLE / who departed this life in / the year 1797 / Aged 43 years. (Footstone)- BARNABAS / DOYLE / ASKEYS CO. / 6 BATT / CUMBERLAND /MILITIA / REVOLUTIONARY / WAR / 1750 / 1797. In / Memory of / MARY DOYLE / who departed this life in / the year 1833 / Aged 81 years. Elizabeth Fegan / Died June 14, 18?? / Aged 83 years 9 mo / & 26 days. In Memory of / James Fegan / Who departed this Life / Dec'r 22, 1853/ Aged 78 years 10 mo & 7 / days. Margaret E. / daughter of / M.W. & ?? Fegan / Died Oct. 8, 1862 /Aged 5 years 1 mo / & 22 days. Sarah A. / Dau. of / John & Nancy T. / Crouse / Died / Oct 3, 1863 /Aged / 18 yrs 9 mo & 17 d.
Our Beloved Mother / JUDETH M. SKINNER / Died Nov. 5, 1859 / Aged 73 years 7 mo & 11 dys / John Skinner / Mary Skinner / William Skinner/ David J. Skinner. Mary A. / Wife of / William McElheney / Died / Sept 9, 1877 / Aged /60 yrs 10 mo & 13 / dys / May she rest in peace. JOHN A. / son of P.S. DOYLE / Died / June 11, 1850 / Aged 7 mo. & / 8 dys. John / Son of ??? / Sarah McIhany / Died / Aug 20, 1883 / Aged 2 mo & / 12 days. [John, son of Sarah McElheny, died Aug 29, 1833, aged 2 M. 12 Days. William McElheny / Died / Jan 22, 1819 Aged / About 52 years / ??? James M. / Son of / Maries ??? / Piper / Died / Feb 5, 1885 / Aged / 19 yrs 11 mo & 23 / days. Our Brother / William H. Eckenrode / Died / Aug 2, 1863 / Aged /21 yrs 1 mo & 7 days / May his soul rest in peace. Our Father / Conrad EcKenrode / Died / Aug 12, 1863 / Aged /51 years & 11 mos / May his soul rest in peace. Rosetta May / Dau of Rilla A. / Eckenrode Died / May 30, 1877 / Aged/ 1 yr 1 m & 5 dys. Norman A. / 1899 1974 / Mort. In Memory of / Betty C. Mort Lacher / June 12, 1924-Jan 29, 1986 /Remains in Sunset Memorial / Albuquerque, New Mexico. George EcKenrode / Died / Sept 12, 1863 / Aged / 13 yrs 5 ms & / 6 dys. Rosanna / Wife of / Geo EcKenrode / Died / Oct 7, 1881 / Aged / 59 yrs 9 mo. Our Mother / Catharine A. / Wife of / Conrad EcKenrode / Died May 7,1883 / Aged / 64 yrs 6 mos & 11 days / May her soul rest in peace. Fogal / Mother / Margaret H. McCartney / 1895 1974 / My rosary is my faith. Catharine / Wife of / John Rine Sr. / Died / Oct 12, 1838 / In the 48th year of / her Life / May she rest in peace. Matilda / Wife of / Wm. A. Shields / Died June 26, 1865 / In the 45th year of / her age. William A. Shields / Died / Jan 4, 1878 / Aged / 64 yrs 8 mos & / 1 day. Morrow R. Gamble / Departed this life / May 16, 1884 / In the 49 year / of his age. / May his soul rest in peace. Margaret / Wife of / M.R. Gamble / Died / Feb 21, 1871 / Aged 43 yrs/ & 29 days / May she rest in peace. Rachel Rine / DIed / Feb. 9, 1879 / Aged 42 ys / 6 mo & 12 dys /May she rest in peace. ANNASTATIA S. / Dau of / Henry S. & Ellen / DOYLE / Died /Jan. 10, 1861 / Aged / 15 yrs & 28 ds. Ellen S. / Wife of / HENRY S. DOYLE / Died Nov. 25, 1860 / Aged 45 years / 2 mo. & 1 day. HENRY S. / Son of / Edward W. & Nancy / DOYLE / Died Jan. 22, 1859 /Aged 47 years / & 5 Mo. Mary J. / Daughter of / Tho's & Mrs / Harris / Died Aug 27, 1877 /Aged 27 yrs 9 mo / & 23 dys / May she rest in peace. Loretto J. / Daughter of / Sylvester & Agnes / DOYLE Died / Dec. 17th 1850 / Aged 4 years 10 mo / & 15 da. In Memory of / JAMES DOYLE / who died July / 9th 1844 /Aged 60 years & 4 days. In Memory of / MARY / Wife of James Doyle / who died Nov. /18th 1842 / Aged 55 years 8 months / & 13 days. ANNA S. / Wife of / EDWARD W. DOYLE, SR. / Died / March 26, 1869 /Aged 80 yrs & 12 d's / I care not for I have redeemed Thee / and called Thee by Thy name: Thou / art mine. / May the soul of our dear lost Mother / rest in peace. In Memory of / EDWARD W. DOYLE / who was born / Feb. 13th 1781 & died /Feb. 10th 1840 / Aged 58 years 11 months / & 27 days. MARY E. DOYLE / Died / Dec. 30, 1850 / Aged / 1 yr. 2 mo. & 3 ds. Wm. H. DOYLE / Died / Oct. 16, 1856 / Aged 2 yrs. / 9 mo. & 22 ds. In / Memory of / OTHO DOYLE / who was born / March 25th / 1838 & died / ??? 20th 1839 / Aged 9 months & / 25 days. ANDREW McMULLEN / DIED / FEB. 28, 1860 / Aged 58 yrs. / & 4 mo. MALINDA / WIFE OF / ANDREW McMULLIN / DIED / NOV. 26, 1892. / AGED / 81 years. In memory of / Mary / Wife of / Matthew W. Fegan / who departed this life /Aug't. 31, 1854 / Aged 43 years, 6 mo. & 3 / days. J. JANE McDONALD / DIED / SEPT. 29, 1854 / AGED / 31 years. JOHN DOYLE, JR. / Died / Mar. 30, 1861 / Aged / 46 years. B.A. DOYLE / Died / Oct. 24, 1872 / Aged / 62 yrs. 9 mo. & 29 / days. Abraham Hagie / Was Born / May 26th 1790 / Died Oct. 1st 1885 /????? / ????? / ????? / ????? / ????? / ????? / ????? / ????? Annie / WIfe of / Abraham Hegie / Died / Aug 1, 1867 / Aged /67 yrs 5 mo & 12 / days. MARY M. / wife of / JOHN DOYLE, SR. / Died / Nov. 8, 1867 / Aged /70 yrs. 3 mo. & 29 / days. JOHN DOYLE, SR. / Died / Aug. 29, 1857 / Aged 62 yrs / 6 mo & 20 d / R.I.P. JOHN D. / McNEAL / Died Nov. 10, 1833 / Aged ??? / R.I.P. Dr. AUGUSTIN DOYLE / DIED / **cracked, can not read** / Aged 25 years /5 mo & 4d / R.I.P. VIRGINIA M. DOYLE / DIED / May 2, 1864 / Aged 11 years / She is ?? the Lord / ?? ?? and of such in / the Kingdom of Heaven. ?? ANN DOYLE / wife of / Dr. A.C.V. McNEAL / Died / July 25, 1861 /Aged 33 yrs . 11 mo. & 7 d. / R.I.P. John I. His son. 1858 - 1861. Styles B. His son. 1875 - 1878. Martha His sister. 1817 - 1883. PHILIP / McILHENEY / Co. F, 208th. PA. VOLS. / DIED MAY 11, 1929 /Aged 82 years. RACHEL COYLER / HIS WIFE / 1847-1913. MARY A. McELHENEY / WIFE OF / GIDEON HECKMAN / DIED NOV. 10, 1878 /AGED / 75 YEARS. MARY BIVENS / DIED / DEC. 1864 / AGED / 58 YEARS. McCARTNEY / MINNIE A. McCARTNEY / NOV. 23, 1860 / AUG. 11, 1927. Joseph W. / Son of / Sylvester & Harriet / McElheney / Died / July 28, 1865 / Aged 1 y & 8 mo. Sylvester W. McElheney / Co. I 208 Regt. PV. / Died / April 20, 1865/ Of wound received in the / Battle of Steadman / Aged / 27 years /McElheney. Harriet A. / Wife of / Sylvester W. McElheney / Died / Dec. 10, 1906/ Aged / 69 yrs 9mo & 2ds. T.J. McELHENEY / DIED Aug. 13, 1897 / Aged 85 years. / Erected byAnnie E. Doyle. JUDITH / Wife of / T.J. McELHENEY / Died / Jan. 29, 1869. / Aged 64 years. / May she rest in peace. DOYLE / ANNIE E. DOYLE / APR. 28, 1863 / DEC. 15, 1925. FATHER / EDWARD B. DOYLE / BORN OCT. 4, 1819 / DIED NOV. 24, 1887. MOTHER / CAROLINE / HIS WIFE / DIED JULY 27, 1878 / AGED 48 YEARS. Florence E. / Dau of / George & Amanda C. / Wolf / Died / July 17, 1883 Aged / 1yr. 3mos. & 15dy. / Darling Lamb Farewell / to Thee. Nora / Dau of / Geo & Amanda / Wolfe / Died / June 19, 1879 /Aged 4yrs 1mo / & 13days. Elizabeth C. Best / June 21, 1931 / Nov. 27, 1997 / Devoted Daughter and Loving Sister. Susan Elaine / Daughter of / Gerald & Mary Best / 1948 - 1955. ZEIGLER / ANNIE P. DOYLE wife of / W.I. ZEIGLER / 1855-1897. MARY E. ZEIGLER / 1891-1919. BASIL J. DOYLE / Died / Apr. 17, 1883 / in the 57th yr / of his age / May he rest in peace. ELIZABETH / Wife of / BASIL J. DOYLE / ??? / ??? / ??? Note: Stone is badly decayed an impossible to read any further. CAROLINE T. DOYLE / Died / Feb. 18, 1880 / In the 20 year of / her age. EDWARD J. / Son of / B.J. & Elizabeth / DOYLE / Died / June 19, 1872/ Aged / 20 ys. 8 mo. & 20D. MAGGIE E. / Daughter of / Basil & Elizabeth Doyle / Died June 19, 1870 / Aged 22 yrs. 3 mos. / & 22 dys. / Tho lost to sight to memory dear / May her soul rest in peace. KATIE U. DOYLE / Born Apr. 2, 1863 / Died Aug. 16, 1883 / May she rest in peace. MATHEW W. FEGAN / DIED / MARCH 14, 1888 / AGED / 78 yrsa. & 6 mos. Infant Son / Paul Andrew / Steban / March 28, 1971. Mary C. / Dau of / Wm. & Mary McElhenny / Died / March 15, 1867 /Aged / 14yrs 7mo & 14d / Fondly Loved, Sadly Missed. / Oh weep not for her tis unkindness to weep / Her weary weak body has fallen asleep / No more the fond tie of affection she knows / Oh weep not, Oh break not, that gentle repose. / Moulder. JENNIE M. / Wife of / JAMES DOYLE / Died / March 5, 1874 / Aged /30 yrs. 3 mo. & / 28 days. / May she rest in peace. AGNES SKINNER / Wife of / JAMES DOYLE / BORN / Oct. 1, 1816 / AGED /87 yrs. 7 mo. Edward Ford / Son of / P.T. & Ellen M. / McElneney / Died / Aug. 19, 1881 / Aged / 1yr 8mo & / 9dys. Catharine A. / Infant daughter of / Philip & Ellen / McElheney. Mary C. / Infant daughter of / Philip & Ellen / McElheney. James Son of / Geo & Margaret / Died / June 22, 1888 / Aged / 18yrs 3mos & 10 / days. Geo McMullen / Died / Apr. 19, 1917 / Aged / 78yrs 3mos & / 6days. Margaret Wife of / Geo McMullen / Died / May 14, 1888 / Aged / 43yrs 11mos & / 5 days. Elizabeth / Dau of / Geo & Margaret / Died Aug 2, 1889 /Aged 13yrs 8mos & / 2days. Adelaide dau of / Geo & Margaret / Died / May 15, 1879 / Aged /1yr 4mos & 4dys. A tribute of respect to my beloved husband. / William T. Doyle /Died / Sept. 19, 1887 / Aged / 74 yrs. 7 mos. & 4 / days /?? not for me I'm free from pain, / dear wife my souls at rest. / your loss is my eternal gain, / my home is with the blessed. /Requiescat in peace. Elizabeth / Wife of / William Doyle / Died / ??? / ??? (New stone.) DOYLE / JOHN J. / June 18, 1843 / July 16, 1900. (New stone.) DOYLE / ELIZABETH A. / June 13, 1850 / February 21, 1929. (Old stone, left side.) John J. Doyle / Died / July 16, 1900 / Aged / 57 yrs & 28 / days. (Old stone, front side.) Elizabeth A. / Doyle / 1850-1929. (Old stone, right side.) Eva M. / Dau of / ??? / Doyle / ?? 25 ?? / ??? (Old stone, rear side.) Mary Ann Doyle / ??? 18 ??? / ??? 26 ??? (Old stone, rear side.) Agnes, wife of / Sylvester Doyle / ??? (Old stone, rear side.) Barnabas A. / Doyle / Oct. ??? / ??? Hattie M. / Wife of / James M. Rowles / Died / Oct. 26, 1886 / Aged / 26yrs 7mos & 27 / days. Oh ??? in such a world as this / could bear their lot of pain / Did not one radiant hope of bliss /unclouded yet remain. Elizabeth L. / Dau. of / Alonza & Clara / Doyle / May 21, 1905 / ??? William C. / Son of / J.M. & H.M. / Rowles / Died / Sept 16, 1883 /Aged / 5mo & 16dys. Alonza E. Doyle / Oct. 4, 1882 / May 30, 1941. Ella C. / Gipe / Died / Apr 15, 1882 / Aged / 1yr 6mos & / 27days. Rosanna / Gipe / Died / Nov. 28, 1881 / Aged / 5yrs 8mos & / 21 days. John S / Warner / Cpl / US Marine Corps / World War II / May 14, 1913 / May 8, 1981. Josephine F. / Warner / 1913 - 1982. Mary McEnespy / Campbell / Nov. 19, 1898 / Aug. 24, 1989. Michael Gerrity / Son of / Harold D. & Dorothy M. / Best / 1949 - 1961. Joseph Stuart Murtaugh / July 15, 1912 - December 3, 1973. His Wife / Dorothy Helen Steinmetz / April 23, 1914 - (No date.) /Requiescant in Pace. John H. Mohn / Born Aug 25, 1837 / at ??? ?, Ohio / Died / Feb 11, 1874 / Aged / 36yrs 5mos & 17 / days. Elizabeth C. / Dau of / Jacob & Mary / Eckenrode / & wife of / John H. Mohn / Died June 4, 1875 / Aged / 32yrs 6mos & 27 / days. MARY E. FEGAN / DIED / Dec. 16, 1909 / AGED / 68 yrs. 9 mo. MARY A. MELOY / 1847-1922. ANNIE M. MELOY / 1855-1920. William / Hockenberry / Aged 74 years / Co. E. 29 Regt. Heckman / Joseph N. / 1902 - 1974. Thomas E. / 1904 - 1998. 1894 Patrick F. 1918 / Co. C. 131 Infantry / Killed in France 1918. Harriet. His wife / 1861 - 1930. Fegan / Hohn A. Fegan / 1851 - 1917. Fegan / S. Sylvester / 1869 - 1941. Fegan / M. Melinda / 1876 - 1935. Anna Helena / 1889 - 1945. John Stephen / 1882 - 1947. Elizabeth Cecelia / 1872 - 1955. Crouse / John B. / 1877 - 1961. Crouse / Maril V. / 1895 - 1983. Hammond / Father / Albert M. / 1885 - 1963. Hammond / Mother / Cora E. / 1885 - 1969. Hammond / 1907 Joseph A. 1966. Hammond / Father / Thomas E. / 1920 - 1990. Footstone: Thomas E. Hammond / PFC US Army / World War II /May 14, 1920 - Oct. 17, 1990. Gipe / Arthur J. / 1939 - 1991. Maggie E. / dau of Lewis & Alice / Eckenrode. Died / Aug 14, 1892 Aged / 7mos & 3 weeks / ??? / ??? / ??? / ???. James M. / Son of / Maries ??? / Piper / Died / Feb 5 1885 / Aged /19 yrs 11 mo & 28 / days. Mary E. Piper / 1839 - 1917 / James M. Piper / 1865 - 1885. WISE/ /JOHN E. WISE / 1848-1922. CAROLINE McDONALD / HIS WIFE / 1847-1918. Heckman / 1869 / William M. 1946. Heckman / His Wife / 1872 Nancy Wise 1951. Heckman / 1909 Mary Elizabeth 1951. Heckman / 1907 Annie B. 1993. Heckman / John A. / June 10, 1897 / Jan. 31, 1994. Heckman / Betty Rose / Oct. 27, 1929 / Feb. 24, 1930. Giedrys / Felix / 1909 - 1970. Giedrys / Vanda / 1917 - 1980. Nannie Watters / Wife of / James Funston / 1852 - 1935. James McMullen / Died / May 21, 1877 / Aged / ???? John J. McMullen / 1846 - 1918. Vincent. Son / 1873 - 1893. David L. / Son of / David E. & Martha / Ferguson / 1899 - 1899. John Alex Ferguson. Son of David E. & Martha E. Price. July 30, 1884 - Oct. 19, 1884. Infant Ferguson. Son of David E. & Martha E. Price. 1881 - Nov. 14, 1881. Alexander Price / 1851 - 1922. Requiescant En Passe / Robert Price / Born Sept. 28, 1812 / Died Jan. 22, 1887 / ??? / ???. Requiescant En Passe / Rachel Skinner / Wife of / Robert Price /Born May 5, 1817 / Died Sept. 20, 1902. George S. Shields / Died / Nov. 13, 1894 / Aged / 59 years 2 mos & 1 / day. / Private of Co. B. 158 / Regt. Cav. of Co. K. / 201 Regt. Pa. Inf. Mary A. / Wife of / Geo Shields / Died / Feb. 23, 1917 / Aged /73 years 3 mo / & 2 days. Francis Shields / 1875 - 1922. Patti Ann Best / April 23, 1969. Peter R. Shields / Born July 9, 1823 / Died March 19, 1897. Jane M. Shields / His Wife / Born Jan. 18, 1830 / Died Nov. 25, 1894. Mary L. / Daughter of / Chas. S. and M.E. / Shields / Died Oct. 6, 1896 /Aged 5 yrs. / 7 mos. 3 days /Fondly Loved, Sadly Missed. / Oh weep not for her tis unkindness to weep / Her weary weak body has fallen asleep / No more the fond tie of affection she knows / Oh weep not, Oh break not, that gentle repose. Charles S. / Shields / Died Nov. 29, 1895 / Aged 74 yrs. / 4 mos 19 days./ Co. F. ??? Regt. / Pa. Inf. / May his ??? / The ??? ??? God. / rest in peace. Amen / Shields. Melissa E. / Wife of / Charles S. / Shields / Died Aug. 1, 1914 /Aged 60 yrs. / 9 mos 26 dys. J.T. Logan / Feb. 28, 1848 / Oct. 1, 1896 / Logan. Elizabeth / Wife of / James Collins / Died / Oct. 8, 1867 / Aged /50yrs & 21dys. Collin Mark / McKinzia / Died / January 6th 1842 / Aged 87 years /May he rest in peace. / Also / In memory of / Ann. His wife / Aged 88yr. Marion Fogal / Gardner / Jan. 20, 1928 / Jan. 7, 1994.